Who stands to gain the most from the march of the robots? It's widely accepted that artificial intelligence (AI) will have a huge impact on our lives in the coming decades - but what's its value to the global economy? According to a new report, global GDP will be 14% higher in 2030 as a result of AI - the equivalent of $15.7 trillion, more than the current output of China and India combined. The report, Sizing the Prize, was launched by PwC in a session at the World Economic Forum's Annual Meeting of the New Champions 2017 in Dalian, China. 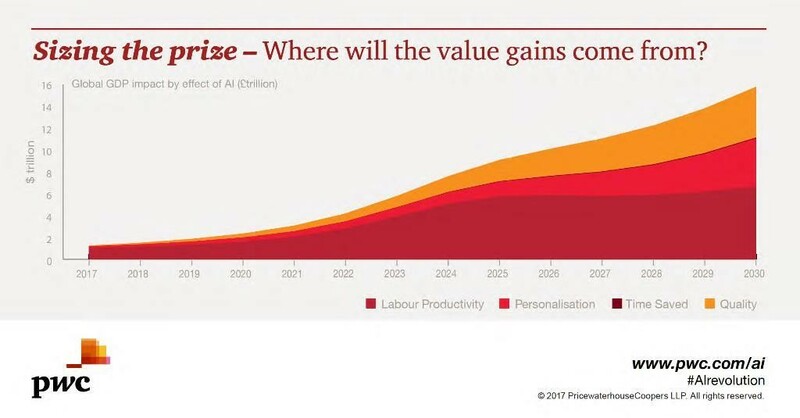 Improvements to labour productivity will account for over half of all economic gains from AI between now and 2030, while increased consumer demand resulting from product enhancements will account for the rest. Regional gains will be most strongly felt in China, which will receive a 26% boost to GDP in 2030, followed by North America (14.5%). 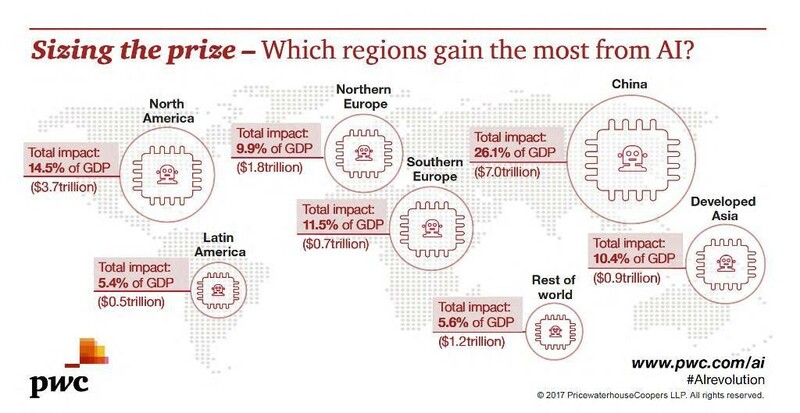 Together, these regions will account for almost 70%, or $10.7 trillion, of AI's global economic impact. North America's readiness for AI and the high number of jobs that are susceptible to replacement by more-productive technologies mean that the region will initially experience faster gains than China. However, the Asian giant will begin to pull ahead of the US within 10 years as it closes the technology and expertise gap. China has become a world leader in AI development, filing patents at a rate that significantly outpaces other countries. Accenture analysis, meanwhile, shows that AI could boost China’s productivity by 27% by 2035. Europe and developed countries in Asia also stand to benefit significantly (9-12% of GDP in 2030), while developing countries in Africa, Latin America and Asia will experience only modest gains (less than 6%). 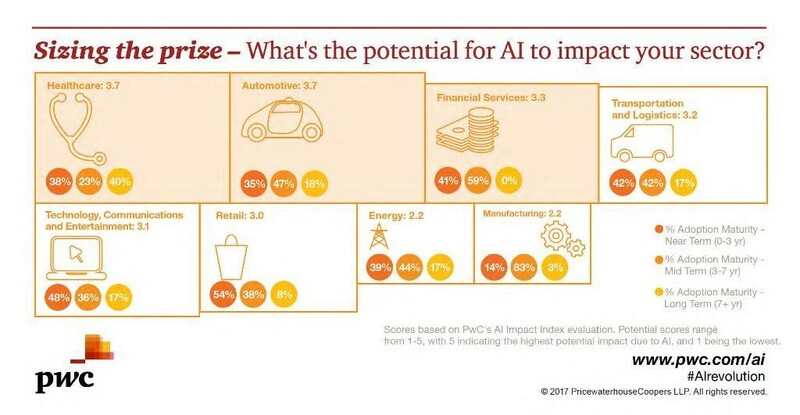 The benefits of AI will be felt differently across sectors, the report's authors go on to say. Retail, financial services and healthcare stand to reap the rewards as AI increases productivity, product value and consumption. AI was the subject of another session at AMNC17, which asked: As AI becomes more autonomous, will it act in our best interests? Should we fear it? No, said Infosys CEO Vishal Sikka. “It's not the machines versus us, it's machines helping us”, said Pascale Fung, Professor, Department of Electronic and Computer Engineering at the Hong Kong University of Science and Technology. In order to control AI, however, we need to come up with a totally new type of regulation and more robust governance, said Yale University's Wendell Wallach, a sentiment that was also echoed by the authors of the PwC report. There is, however, an emerging “AI divide”, said Pascale Fung. “There is an AI divide between developers and consumers. We [the developers] don't have the fear, the same concerns. There is a divide between countries who have more research labs, and those who don't.